Through our targeted work with community groups and inactive women & girls Tees Valley Sport have linked up with Halo. 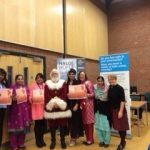 The Halo Charity is a national project that supports victims of honour-based violence, forced marriages and FGM by providing appropriate advice and support to victims. Our work with Halo began in 2016 through the ‘Boro Girls Can’ Project https://www.youtube.com/watch?v=_4fNF0XrVmk 10 women who had never previously been able to prioritise or contemplate physical activity were engaged in a supported walking and running programme which was linked to a local female run leader. By offering empathy, encouragement and support these inactive women progressed to being regular participants. A number of the participants have transformed their lives through involvement in the programme. 45 year old Aysha was new to the Tees Valley with no family and friends, no employment and diagnosed as suffering from depression, Aysha felt her life was over. She felt her prescribed medication and counselling were not making a difference. Through informal social referral, Aysha accessed Halo’s programmes and signed up for the walking and running activity group. Aysha walking and running has improved her levels of fitness, introduced her to friends with similar backgrounds and given her confidence to challenge her comfort zones. She now feels integrated in the local community and has a social network of people who are able to empathise with her experiences. We are supporting Halo and have continued to work together building on the success of this programme. Halo have recently been successful in accessing £6000 of funding from the Tees Valley Community Foundation Inactivity Fund. With this they will run a programme of four different activities targeting isolated and vulnerable women. The funding also has a focus on developing the staff from Halo and the vulnerable women to become coaches & leaders providing a workforce to make the project sustainable beyond the initial funding.